Concert Ukulele is a mid-sized Ukulele. Concert Ukulele's produces a deeper sound to the Standard Ukulele. Raymond builds his Concert Ukulele's with bow back (ovation) to produce an even wider tonal range for the Concert Ukulele. Raymond will build you a custom Concert Ukulele with all Koa wood, cedar or spruce soundboard. The Concert Ukulele can be built with 4, 6, and even a rare 8 string. 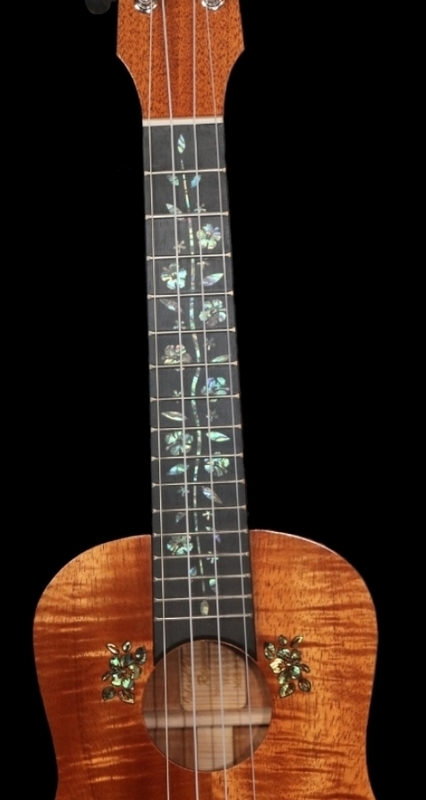 Customize your Concert Ukulele with Abalone inlaid around your Concert Ukulele face, sound hole, or fret.